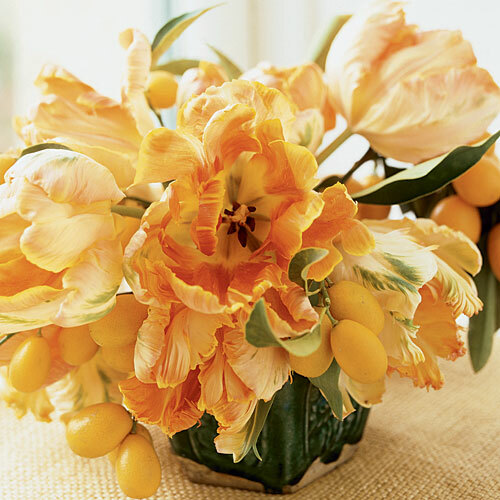 A simple cluster of cheerful parrot tulips and kumquats celebrates the season’s offerings. The tulips’ apricot-colored petals pair perfectly with the kumquats, still on the branch. The result is as fresh and joyous as spring itself. Parrot tulips, with their jagged, lacy edges and petals that open like a butterfly’s wings, have much more interest and grace than the standard tulip shapes. These pale apricot ‘Evelyn’ and buttery ‘Golden Celebration’ roses need very little embellishment. A few stems of ivy with their nearly black berries invite attention, while delicate wisps of clematis spill playfully out of a terra-cotta pot. 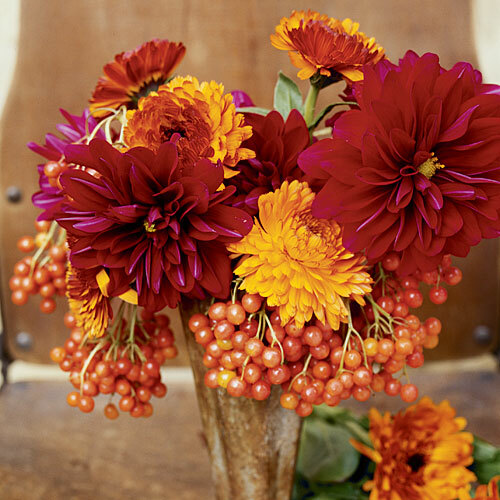 This daring combination of magenta dahlias, fluffy orange calendulas, and plump, glossy viburnum berries speaks to the bounty of the fall harvest. Their vivid shades mirror the glowing foliage worn by many trees this time of year. 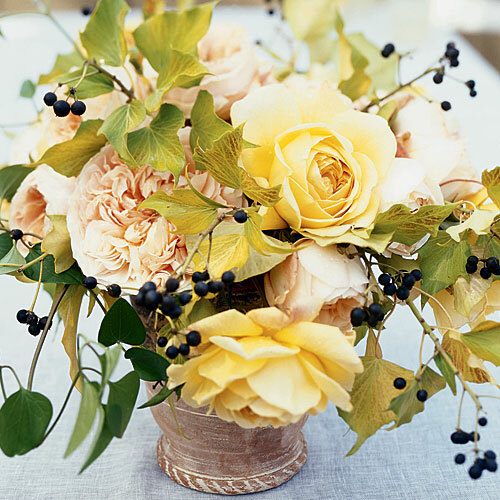 A rustic cast-iron vase props up bursting blooms while the berries tumble over the lip. A dramatic grouping of amaryllis in pure white, blush pink, and soft green creates a wintry mood of tranquillity. 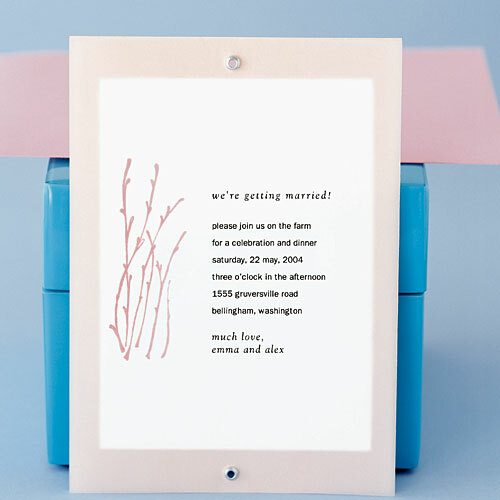 A square glass vase shows off chunky green stems without distracting from the enchanting flowers above. To put the finishing touch on your cake, choose any flowers that complement the style and colors of your wedding. We used tuberoses, lisianthus, and white roses. Try fresh-cut flowers from your garden or have a florist order blooms; be sure they are pesticide-free. Beloved for their timeless form and classic fragrance, roses are a fashionable choice for summer brides. Centuries of hybridizing allow for a wide range of colors and looks. Here, a handful of David Austin English Roses makes a stunning bridal bouquet. 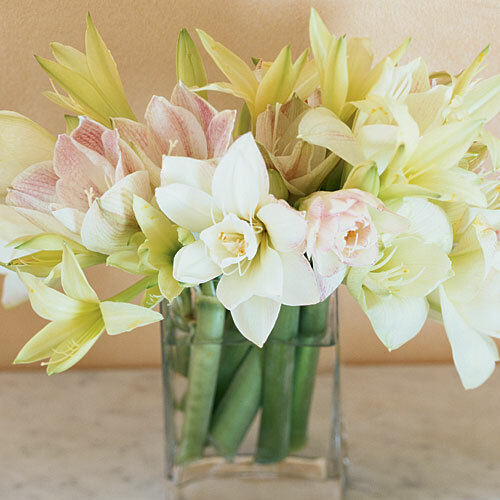 With a lean, graceful profile, callas are the ideal choice for a modern, streamlined summer bouquet. Hydrangeas’ large, snowball-shaped flower clusters come in pink, blue, and greenish white; just a few blooms make a bouquet. In lightly shaded beds, hydrangeas (H. macrophylla) combine well with ferns of all kinds. Festive and available in many shapes, sizes, and colors, dahlias are surely late summer’s perfect flower. Easy to grow from bulbs, fragrant hyacinths are a fresh choice for a spring bride. 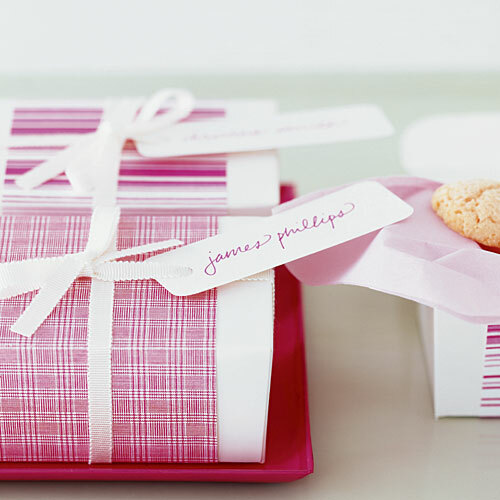 This chic nosegay is wrapped in matching ribbon. When you grow your own bouquet of flowers and pick them just before your ceremony, they’re incredibly personal and as fresh as morning dew.